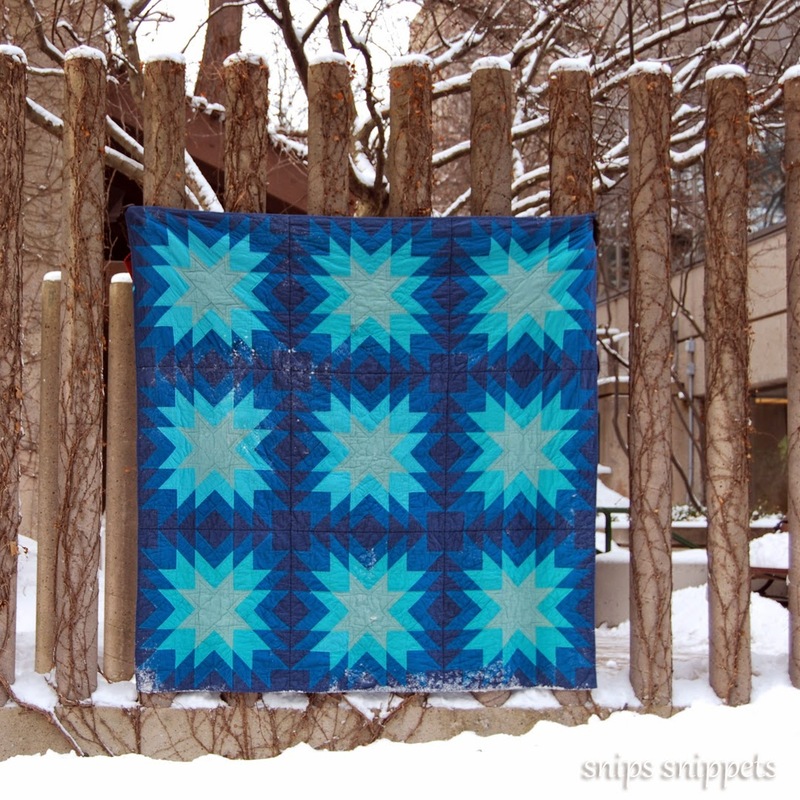 snips snippets: Fusion Stars Quilt for Blogger's Quilt Festival! It's beautiful! Is your sister tired of it yet? Gorgeous quilt. I am glad you didn't use sashing for this one.I love where the blocks meet. Great colors too. Beautiful quilt! It's very eye catching!! Nicole, your quilt is really beautiful! I adore these colours! The feel like magic to me! one of my favorite quilts of yours!! i love the colors!!! that was a lot of paper!!!! it's beautiful!!! good entry. it was worth the mini tree you sacrificed for it. =) I'm bummed for you about the GW, but looking forward to seeing it in the fall line up because you will surely be done by then. or do we need two years for this quilt - one to piece, one to handquilt? fingers crossed for you. It is nice pattern and color combo and your pictures with snow are great to look at. So no I don't mind to see it once more for sure. I am visiting from the BQF and I think this quilt is just beautiful! I love all of the blues...my favorite color. It even looks soft. Fabulous quilt! Wow! So beautiful! I love it! Great work - your colour choices make them seem like distance stars softly glowing in the night sky! Sigh. You know I love this one. Nice to visit it again and admire it's shot cottony goodness. I can totally see why this is a favourite of yours, it's super striking. And I LOVE the way the fabric is all crinkly it looks so snuggly!